Drinking too many energy drinks is bad for your health. Energy drinks have three times the caffeine of a cola drink. They also contain high amounts of sugar, or artificial sweeteners for the diet versions. The sugar combined with the caffeine gives you an instant energy boost that can last for an hour or two. However, once the effect wears off, your tendency is to take more, which can cause you to have an energy drink crash. Fortunately there are some things you can do to cure the effects of an energy drink crash. If you are a regular consumer of energy drinks, you know that the energy boost can only last for a short time. The effect can last for an hour or a few hours, but afterwards you will feel lethargic, anxious, irritable, fatigued and may find it difficult to sleep. You may also suffer from headaches. In the end, because you feel that your energy has been drained, you will be tempted to reach for another energy drink -- increasing the risk that you will become addicted to it. Energy drinks contain a large amount of caffeine and sugar. These are the main ingredients that instantly boost your energy. Traces of caffeine are not totally flushed out of your body and will build up when you keep drinking energy drinks. 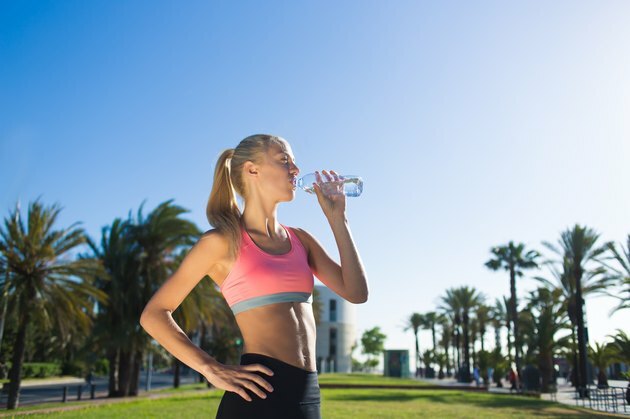 Drink plenty of water to immediately flush the caffeine from your system. Water also refreshes and gives you energy without any side effects. When you feel tired and you still have plenty of things to do, stop and take a break instead of reaching for another energy drink . Get out of your chair and walk around to stimulate your circulation and stretch out the kinks from your arms, shoulders, neck, legs and back. Go outside or open a window so you can have a breath of fresh air. With your blood circulating better, you will enjoy a natural energy boost. Sleep is a great energy booster. Take a short nap during break time at the office instead of going for coffee or a snack. Sleep is better than food when you are feeling very tired. Close your eyes and clear your mind. Even a catnap will replenish your energy. You can think more clearly, and you will be more coherent and alert, after a few minutes of light sleep. Fruits and vegetables are great energy boosters. Instead of drinking a can of energy drink when pulling an all-nighter or catching up on work, prepare bite-size pieces of fruits and vegetables that you can eat while you work. Include water and fresh fruit juice in your snacks for an instant energy boost. The natural sugars from fruits and vegetables will supply you with energy, and you will be eating healthier food rather than bombarding your system with caffeine, artificial sweeteners and chemicals. At the same time, water and juice help flush out any toxins that may have built up from unhealthy eating. Can You Stop Sugar Cravings With Apple Cider Vinegar?